The Whippet temperament is a quiet, yet active one. Let’s learn a little bit more about the breed before we examine its temperament. The Whippet (also referred to as an “English Whippet” or “Snap Dog”) belongs to the sighthound breed. Other well-known sighthounds include the Irish Wolfhound, the Greyhound, and the Scottish Deerhound. In fact, the Whippet is actually a descendant of the Greyhound. Whippets are medium-sized dogs. They are also among the fastest dogs in the world (if not the fastest). Whippets are neck-and-neck with their Greyhound forefathers when it comes to speed, with the Whippet topping out at around 35 miles per hour! You really could say they whip around corners! Because of their impressive speed, people also refer to Whippets as “miniature Greyhounds,” and they still work as racing dogs today. 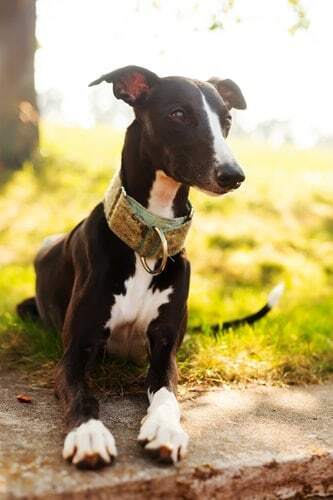 Now that you are more familiar with the breed, let’s take a look at the Whippet temperament. 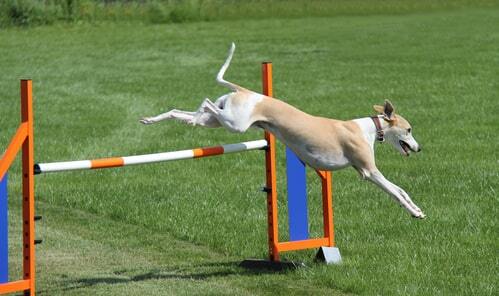 It’s no surprise that people consider the Whippet to be a lively animal. After what you’ve just read, it’s probably difficult to imagine a lazy Whippet! When she’s home, though, it’s an entirely different story. She’s much calmer. In fact, she becomes a real couch potato – probably because she’s saving up her energy for the next big race! When she’s a puppy, her lively nature may involve such distasteful traits as being destructive and even mischievous. As an adult, however, her temperament evens out, and she becomes graceful and quiet. It’s a complete 180! The Whippet is a rather quiet animal. You should take care not to be rough with her during training. She is very sensitive, both physically and mentally. You do have to find a delicate balance, however, so as not to encourage the development of Small Dog Syndrome. This is where a small dog turns into a bully because she’s allowed to get away with bad behavior. This kid gloves treatment applies to the Whippet’s mannerisms with children as well. She is great with kids of all ages, so long as they don’t roughhouse with her or tease her. Because the Whippet is such a gentle animal, she is rather friendly and affectionate with other humans. She is decent at keeping watch, to the point where she may be cautious at first about trusting strangers. The fact that the Whippet is an intelligent animal makes it easier to be around her. She’s also cleaner than most other dogs, and she doesn’t mind traveling. The most effective methods of training a Whippet involve running (no surprise) and games. Introducing variety into her training schedule yields the best results. One thing you definitely want to invest in before bringing home a Whippet? A fence! You want to make sure you keep this little bullet train in an enclosed area – unless you’re prepared to run 35 mph to chase after her if she gets out! And while we’re on the topic of training, your Whippet, like many other breeds, does best in life if you socialize her as early and often as possible. The more people and animals you introduce her to, the more accepting she will become, and the more well-rounded she will be as an adult. One thing to keep an eye out for is her interactions with cats and other small animals. She does have a keen hunting ability and, given the chance, will even kill her prey once she catches it. She usually does better with house cats if they grew up together. But even then, it’s rather risky to have a Whippet in the same house like a cat. It’s probably a better idea to refrain from having a cat around a Whippet. When it comes to housebreaking, however, every Whippet is different. Some can give you a hard time, while others will take to it more naturally – it all depends on the dog. For help with training your Whippet dog take a look at The Online Dog Trainer by Doggy Dan. Doggy Dan is an expert Dog Trainer based in New Zealand. His online resource contains Hundreds of Excellent Dog Training Videos that will take you step-by-step through the process of developing a healthy, happy well-behaved dog. Check her ears regularly for signs of infection and trim her nails often to prevent discomfort while walking. Typical Whippet coat colors include blue, fawn, red, brindle, black, and white. Give your Whippet the proper nutrition and exercise, as well as regular vet check-ups, and he can easily live for between 12 and 15 years. The lower end of the spectrum is her typical life expectancy. A Whippet rarely suffers from the common kinds of ear infections, skin allergies, and digestive issues that other breeds can experience. Even the more common canine issues, like genetic eye defects or hip dysplasia, rarely appear in the Whippet breed. The only thing to maybe keep an eye out for is a possible heart condition. The Whippet’s heart is large and beats slowly. Sometimes, while resting, a Whippet can experience bouts of irregular/intermittent heartbeats, which can result in an arrhythmia diagnosis. However, as soon as the Whippet launches back into exercise, you’ll notice that heartbeat jump right back up to its regular, consistent beat. An adult Whippet weighs only between 15 and 31 lbs. Their heights range from 18 to 22 inches tall. If you love mixed breeds, and you love Whippets, then you’re bound to love a Whippet mix. There aren’t too many mixes out there yet, but the demand for Whippets and their mixes is on a steady increase. Have you decided that a Whippet puppy would make the perfect addition to your family? If so, congratulations! You can find a Whippet puppy for sale either from a breeder or at your local adoption agency. There are upsides and downsides to both adopting and buying a dog from a breeder. It is important to do your research before making a decision that will affect what could be, at the very least, the next 12 years of your life. 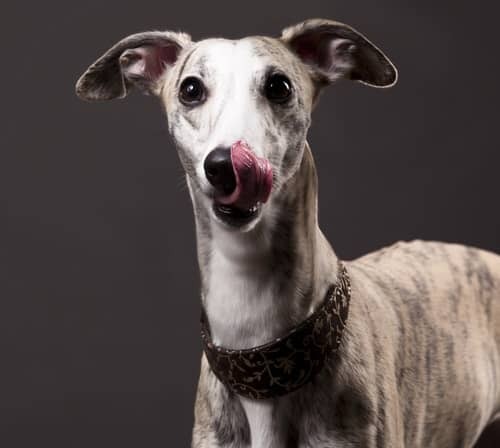 The average Whippet price is between $800 and $1,500. There are many factors that decide the price of a dog, from his lineage to the price the breeder simply decides to charge. The rarity of a particular breed in a certain location or even a less common coat color can also affect the price of the dog. If you want to adopt a Whippet puppy, you may be able to find one through your local rescue organization. There are definitely some perks to adopting a dog. For one thing, a Whippet that is up for adoption will always cost less than one for sale through a breeder. Keep in mind, though, that while the cost of the dog may be lower, you will still have to budget for the dog’s needs over the course of his lifetime. This includes food, possible grooming costs, and obedience training, and, of course, healthcare costs. Most of the dogs who are up for adoption are older dogs. This is a good thing because most older dogs have some sort of training, and so they are out of their destructive puppy phase. They also know to go outside when they need to use the bathroom, and sometimes the shelter will even train its dogs to do tricks in an effort to make them more appealing for adoption. The downside to adopting a dog, though, is that you may never know the dog’s true history. You can only know as much as the shelter knows, and if they simply picked the dog up off the street to save its life, then neither you nor the shelter can know much more about it than that. If you’re considering buying a Whippet from a breeder, be sure to do your homework first. You can go on official websites for the breed and make a list of names of breeders in your local area. From there, you can research the individual breeders to see what others have said about them on social media. A bad review can go a long way. Remain alert, though, of too many good reviews, too. The breeder may be paying people or otherwise offering some sort of perk for people to post only good things about the breeder. When dealing with a breeder, make sure you get all the necessary paperwork, including health clearances and certificates. If the breeder says they’ll get the paperwork to you at another time, do not complete the sale until you have the paperwork in your hands. Also, perform a thorough investigation of the premises when you go to meet your potential new best friend. Is the breeder’s house clean or dirty? Are the dogs living on top of each other, or do they have their own space in which to grow? Puppies, especially purebred puppies, can cost a lot of money. You might be drawn in by those puppy-dog eyes but be careful. You want to make sure you’re not dropping hundreds of dollars on a dog who may be sick or have aggressive tendencies because of how the breeder raised her. Can You Keep Up with the Whippet? You now have the information necessary to make a more informed decision about whether the Whippet temperament is right for you. You may also want to check out this article for more specific tips on how to choose the right dog for you. Two important things to keep in mind are that the Whippet doesn’t like to roughhouse and that it’s easy to hurt her feelings. That said, you must still establish dominance with her so that she doesn’t walk all over you. It may be difficult at first to get a handle on the Whippet temperament. But once you two understand each other, you can have quite a rewarding relationship with your Whippet. Previous post: Labradoodle Temperament: Why is the Labrador Poodle Mix So Popular?